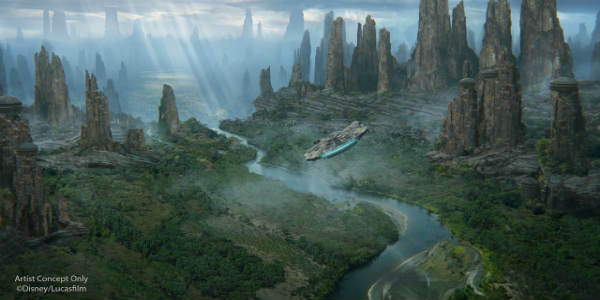 This weekend at Star Wars: Galactic Nights, Walt Disney World revealed the name of the village setting of Star Wars: Galaxy’s Edge, which is set to open at Disney’s Hollywood Studios next year. During the Inside Star Wars: Galaxy’s Edge panels, story editor, Margaret Kerrison, shared for the first time that the name of the village is called Black Spire Outpost. She also shared some of the history behind the name and how this village is closely associated with the geological formations that surround it. 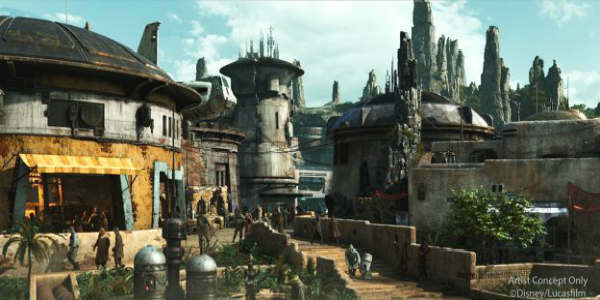 The largest settlement on the planet Batuu, Black Spire Outpost is an infamous stop for traders, adventurers, and smugglers traveling around the Outer Rim and Wild Space. Because it is off the beaten path, this outpost has become a haven for the galaxy’s most colorful — and notorious — characters. Widely known for the petrified remains of its once towering ancient trees, the spires now stand guard across the river valleys and plains. To the first settlers, these petrified spires became more than just landmarks; they became the heart of the outpost itself. As a long-time Star Wars fan, I love the details going into the backstory of this new themed area of the park. What do you think? Star Wars: Galaxy’s Edge is scheduled to open at Walt Disney World Fall 2019.